"Gayle is a dedicated, ambitious, result driven leader and thoughtful individual. If you ever need someone to deliver under pressure, no slip-ups, just results, Gayle is the person. With a lots of marketing experience she is someone who you can learn from. It was a pleasure to work with her." "Gayle is great to work with! She understands sales and marketing especially strategic planning and demand generation. She knows how to get it done." "Gayle is an amazing marketing director with a practical command engaging senior executives in hard-to-reach industries and on emerging/growth technology topics. I'd happily work with Gayle again and recommend her highly"
"Gayle is smart and upbeat, driven and absolutely focused to achieve whatever goals are given to her. She knows her stuff too. While at Trillium I witnessed her transform/reshape the lead gen programs and inside sales team to become a successful and respected contributor to the organization." As CMO, developing and driving global marketing and sales enablement strategies and activities. Leading global world-class marketing and sales enablement teams for increasing revenue growth, and to further establish itslearning as a global market leader in the K-12 learning management systems (LMS) industry. On a global basis, developing and measuring marketing communications, corporate branding, and demand generation strategies including PR, AR, social media and content strategy, positioning and messaging, brand building, integrated campaigns, and global and local events. Leading global marketing team of 8 marketing & sales enablement professionals in support of driving revenue across 9 countries. Developing global marketing strategic plans; integrate separate geographic strategies to align with overall annual business growth initiatives. On track to deliver 48% of global marketing influenced new business revenue in 2015. Measuring and tracking by geographic regions. Increased sales lead volume by 140% YOY by initiating digital marketing strategies; website refresh, online advertising, SEO/SEM, PPC, etc. As a member of the Global Directors' team attend weekly and monthly C-level strategic meetings in Norway. Present global marketing quarterly plans and achievements to the Chairman of the Board, Investors and other Global Board members. Across 9 countries, work closely with local marketing and sales leaders to ensure demand generation activities are closely aligned. Development of global demand generation and campaign strategy to increase EBITDA revenue. Directing budget spend priorities, forecasting sales pipeline by lead stages, and analyzing results using Marketo & SF.com. Create and execute on global social media strategy; consolidating channels, developing content, selecting tools, and designing KPI dashboards. Implement A/B testing methodologies to improve lead generation conversion and response rates. Management of US and global communications including public and analyst relations, and internal executive communications. Obtained position in Gartner's Market Guide for Learning Management Systems, 2015. Secured first Gartner briefing in itslearning's history. Collaborating with C-level team, developed go-to-market launch plan for new global Mobile App. Within 48 hours, the itslearning App became #1 download position in the Norwegian AppStore. Developed and executed global marketing strategies and plans with the primary goal of building a predictable sales lead funnel and brand awareness. Created best practices for measuring and tracking financial results for Trillium Software’s global marketing team. Over a nine year time period, led the global demand generation and business development representative teams to drive $442.2M in sales pipeline. Resulting in approximately $50M+ of enterprise data quality software license closed revenue, professional services, and maintenance revenue. 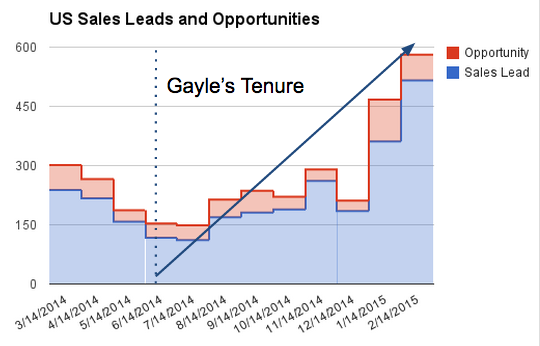 Consistently overachieved my 40% annual marketing influenced revenue targets. Well-proven marketing and sales competencies and company dedication and loyalty drove continual career advancement. Led global demand generation and inside sales teams across 3 countries. Recruited, motivated and retained a team. Conducted annual performance reviews on a regular basis to ensure employee growth. Leveraged SiriusDecisions waterfall process to develop superior and highly effective inbound & outbound demand generation campaigns across multiple-channels, product lines, and key vertical markets. Expanded Trillium's digital footprint and drove revenue growth through digital marketing such as Google Adwords, display and social media advertising, retargeting, geotargeting, A/B testing, webinars, etc. Analyzed and reported web data metrics leveraging analytics' tools such as Google Analytics, Omniture, Hootsuite, etc. to determine future budget allocation and subsequent digital marketing campaigns. Presented digital marketing and social media data analysis and reports in visual data formats for the CMO and C-level executives. Worked closely with leadership team and cross departmental senior management to develop innovative, go-to-market strategies, positioning, and value propositions to differentiate Trillium from its competitors. Planned strategy for trade shows, VIP events, and user conferences. Organized pre-show campaigns to increase ROI, as well as post-show activities to ensure a proper follow up procedure was deployed. Leveraged Oracle Cloud/Eloqua to develop and automate lead scoring models based on marketing behavioral and profile information. Led overall integrated marketing campaign strategy and plans for marketing of products and solutions by outlining key marketing themes, messages, offers, and mediums for promotions to reach both IT and business audiences within Global 2000 companies; leveraging both inbound and outbound tactics. Developed all of the US marketing strategies and campaigns. Oversaw all marketing communications from product launches to PR to advertising to trade shows, branding and development of content and positioning of SasS solutions across the the company. Organized events such as trade shows, webinars, and user conferences. Created and managed communication vehicles and programs (ie., road shows, trade shows, advertising, direct and electronic marketing materials) monitored and continually drove improvement for cross-channel integrated marketing campaigns. Worked with stakeholders across the business to develop ideas and strategies, such as Product Marketing, Regional Marketing, Product Management, and Sales, etc. During tenure at eXcelon, gained a deep understanding of marketing campaign planning, segmentation, customer behavior, fundamentals of sales and marketing psychology, and a basic knowledge of marketing ROI and analytics. Highly motivated Senior Marketing leader and Global Director with solid fifteen years’ experience leading global marketing and sales teams in start-up, rapidly growing, and established SaaS and Enterprise Software companies. Maximizing profitability by developing strategic marketing plans to support the buyer’s journey and customer life cycle. A high performing and confident leader who is inspiring to others, results-driven, self-starting, and a collaborative team player across an organization. Ability to navigate between strategy and execution, and balance marketing campaigns with key channel, business development to meet and exceed EBITDA earnings. Heavy user and experienced in selecting, administrating, implementing, and training of the following marketing and sales applications: Salesforce.com; Microsoft Dynamics CRM; Oracle Marketing Cloud/Eloqua; Marketo; Manticore; HubSpot; Pardot; Ektron; Wordpress; LightCMS, Google Adwords; Google Web Analytics and Reporting; Googledocs; Google Plus, Optimizely; Dropbox; OneSource; Brainshark; Facebook; Instagram; Twitter; YouTube; Vimeo; Brightcove; LinkedIn; Hootsuite; Periscope, etc.